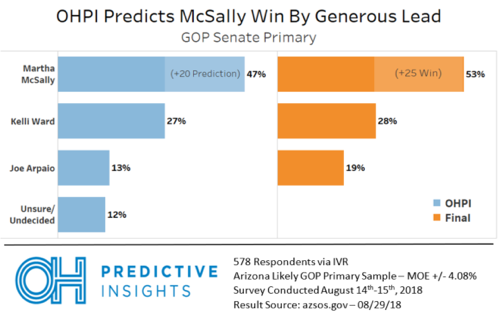 PHOENIX (September 5, 2018) – Arizona’s leading polling firm, OH Predictive Insights (OHPI), is adding more wins to its score card after correctly predicting both Republican Martha McSally’s win in the Arizona Senate race and David Garcia’s win in the Democratic primary for Arizona Governor. Founded in 2016, OHPI correctly called every election that year - a year when pollsters got it historically wrong. The polling firm went on to accurately predict the AZ-08 Special Election, which is notoriously difficult to predict. Since its founding, OHPI has correctly called all 11 races it has polled. “It was important that we called this election correctly, given some of the current rhetoric on polls and the media,” said Mike Noble, Managing Partner and Chief Pollster of OHPI. “Just because the numbers or facts aren’t in your favor doesn’t mean they are incorrect. We pride ourselves on accurately reflecting the mood of the voters in the Grand Canyon State." The most recent OHPI/ABC15 poll, conducted between August 14 and 15, 2018, showed Martha McSally, the GOP front-runner, in the lead with 47% of the likely vote. Kelli Ward was next with 27% and Joe Arpaio with 13%, leaving 12% of voters undecided. This positioned McSally 20 points above Ward and 34 points above Arpaio just two weeks out from Election Day. Compared to McSally’s actual vote of 53%, OHPI was accurate predicting 47%. The same can be said for the Ward and Arpaio actual votes of 28% and 19% respectively, which OHPI predicted at 27% and 13%. The firm also expected McSally to have a 20-point lead over Ward, accurate given that she landed 25 points ahead. The 12% of undecided voters almost exclusively gravitated to Arpaio and McSally, no surprise given the Ward campaign’s implosion in the final days of the race. 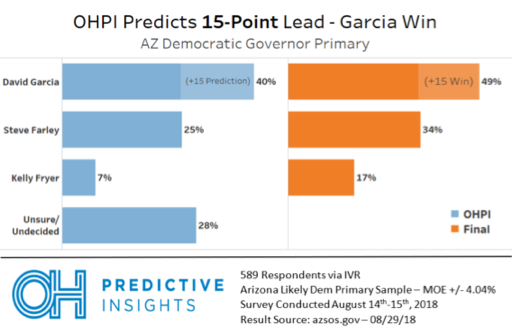 OHPI also accurately predicted David Garcia’s 15-point lead in the Democratic primary for Arizona Governor - estimating a 15-point difference, and Garcia won by 15 points. Garcia’s actual vote came out to 49%, with Steve Farley next at 34% and Kelly Fryer with 17%. These numbers closely mirror OHPI’s predictions of 40% for Garcia, 25% for Farley and 7% for Fryer. The 28% of undecided voters basically broke evenly between the three candidates. “You can wait to see who wins on Election Day - or we can just let you know ahead of time,” Noble quipped. This IVR telephone survey was completed by OH Predictive Insights in partnership with ABC15-Phoenix (OHPI/ABC15) on August 14 and 15, 2018, from a likely Arizona 2018 Democratic Primary voter sample. The sample demographics accurately reflected party affiliation, geographic location, gender, and age. 90% of respondents were Democrats and 10% were Independent voters. 100% of respondents were completed via landline. The sample size was 589 completed surveys, with a MoE of +/- 4.04%. This IVR telephone survey was completed by OH Predictive Insights in partnership with ABC15-Phoenix (OHPI/ABC15) on August 14 and 15, 2018, from a likely Arizona 2018 Republican Primary voter sample. The sample demographics accurately reflected party affiliation, geographic location, gender, and age. 89.3% of respondents were Republican and 10.7% were Independent voters. 100% of respondents were completed via landline. The sample size was 578 completed surveys, with a MoE of ±4.08%. Phoenix-based OH Predictive Insights provides accurate polling, focus groups, data analytics and advanced targeted marketing to political and non-political clients alike. With leading professionals in the advertising, communication, polling, and political arenas, OH Predictive Insights will service political and non-political clients looking to improve their footing on key stakeholders and consumers. For more information, please call 602-254-5159 or submit a request online.